A Cambodian delegation led by General Tea Banh visited Thailand to discuss defense cooperation, among other issues. Earlier this week, Cambodia’s deputy prime minister and defense minister paid a visit to neighboring Thailand to strengthen military ties between the two countries. Thailand experienced a coup in May of this year that has left the country under the rule of a military junta, led by General Prayuth Chan-ocha. The Cambodian delegation was led by Defense Minister General Tea Banh who met with a variety of Thai military leaders, including Supreme Commander Thanasak Patimaprakon and General Prayuth. The visit marks the first high-level military meeting between the two countries since the Thai military seized power in May. The visit takes place amid accusations from Thailand that Cambodia is harboring anti-junta activists. According to The Cambodia Daily, the Cambodian delegation expressed its confidence in the leadership of the Thai military junta, stating that they believed that the military will bring “peace and order” to Thailand and that Cambodian Prime Minister Hun Sen, “understands the situation in Thailand very well.” Banh told the Cambodian media that the two sides discussed military cooperation without providing details about what specific topics were discussed. The Cambodian delegation also raised the issue of migrant workers. The Cambodian side further assured the Thai military junta that it would not harbor any Thai political activists, including Thai red shirt activists. The “red shirts,” in contrast with the pro-monarchy “yellow shirts,” support the ousted government of Yingluck Shinawatra and her exiled brother, Thaksin Shinawatra. Since the Thai coup, several red shirt activists have had arrest warrants issued against them by the National Council for Peace and Order, the post-coup apex governing body in the country. The Thai military suspects that many have crossed the border into Cambodia. In general, the Cambodian delegation went to great lengths to convey to the Thai military junta that it was entirely in favor of the coup in Thailand and of what the military was doing to maintain law and order in the country. Banh assured Prayuth that everyone from Cambodian King Norodom Sihamoni to the country’s generals and politicians support the Thai junta. For Cambodia, the Thai coup represents a significant source of risk. As other analysts have noted, since the coup, Thailand’s military junta has deported thousands of Cambodian migrant workers. These migrant workers send back remittances from the wages they earn in Thailand. 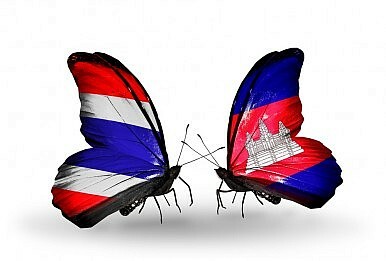 As such, the Thai coup will have economic consequences for Cambodia. Given the populist nature of Yingluck Shinawatra’s government policies, the junta apparently feared that these migrant workers would become an additional political nuisance by backing the red shirt cause in Thailand. The Thai military is having difficulty proving this coup is any different from previous incarnations. What Does Thailand’s Royal Shockwave Mean for its Future Politics?What Thailand’s Elections Can and Can’t Do for its DemocracyThailand’s Inequality Challenge Looms Large Ahead of 2019 ElectionsThailand’s Politics Heat Up Ahead of Elusive ElectionWhat’s in the New Thailand-Cambodia Border Checkpoint?